I stumbled across a delicious-looking recipe awhile back and I haven't really had an excuse to make it. Apple pie backed in an apple. Brilliant and adorable! 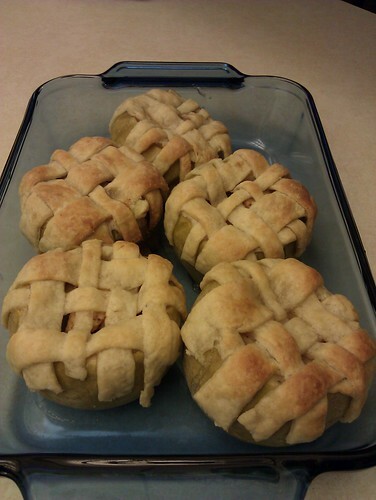 So for Thanksgiving I thought I would make several little apple pies. The whole process is pretty easy. 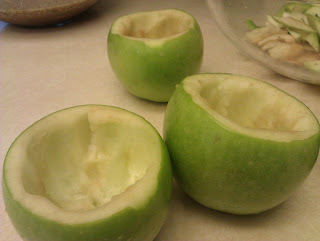 You chop off the tops, dig out the innards, and stuff them back with tasty sugary apple goodness. Once they're stuffed, you just weave a lattice (or if you want just a simple pie crust with vents) and pop them in the oven. Now the recipe I took this from recommended tossing the tops and the innards and just cutting up more apples. I didn't really see the point in that. Why toss perfectly good apple to then chop up more apples to use? 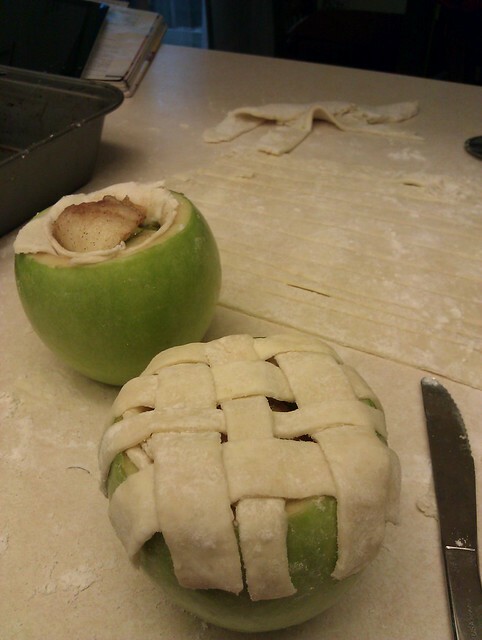 So I used part of the tops and portions of the apple innards (minus the core of course). I actually didn't end up using any extra apples, so now I have to figure out what to do with a whole bag of them. The apples turned out pretty nice. I did end up with some split apples, but I blame that on being unable to get my oven above 350 degrees and not so much on the recipe itself. There were several comments on the website noting that people had split apples and it sounded primarily because they weren't baking at 375 degrees. The entire thing is edible, which makes me very happy. I'm looking forward to trying one tomorrow. it certainly is! I hope you enjoy!